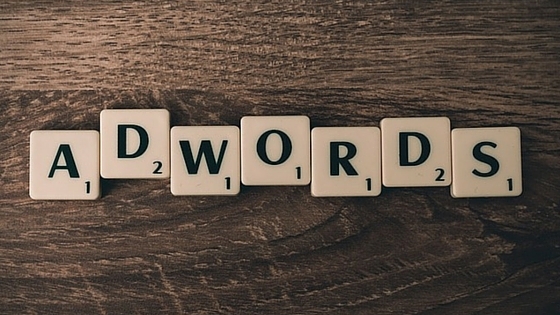 Google AdWords Is Crucial To Your Business. Learn Why! When a user enters a search query on Google.com, Google displays webpages and ads that most relevant to the query entered. The more relevant the ad is to the user’s query, the higher the ad will appear on a results page. Note: 33% of all Google search clicks are generated through mobile. Google AdWords is the largest PPC or paid online advertising platform which uses a bidding system for your ads to appear to the top or to the right of search results. Other platforms (Yahoo, Bing) use the same concepts. By the end of article you’ll familiar with AdWords. PPC stands for Pay Per Click, also called CPC (Cost Per Click). Advertiser will be charged only when the ad is clicked (not when the ad is shown). Google runs an auction for each query and displays the ads in order based on bids and relevance. About 97% of Google’s total revenue comes from advertising. A higher quality score means a lower bid, which means you could win the auction with a cheaper bid. It offers a variety of advertisement formats in terms of videos, images and text. To know more about Google adword, Watch this Video. Under account level, you have one or more campaigns (up to 25 campaigns) Each campaign has its own settings, budget, targeting, and other preferences. 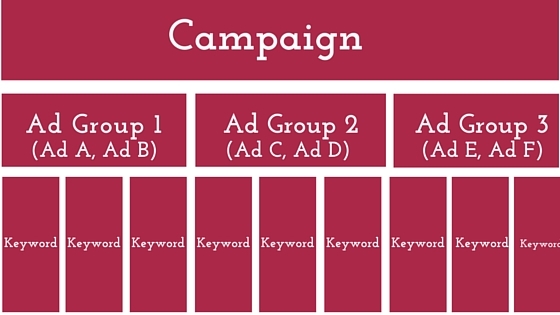 Ad groups contain group of keywords and exist within each campaign. At this level, you can select keywords and write your ads. You can have up to 2000 ad groups per campaign. You must create multiple ad groups under one campaign. In order to create a successful campaign you have to pick the right and most relevant keywords. Words and phrases used to target the user queries. Broad Match – For example, Black Shoes. Your ad will be shown to any query which contain these terms. This type will bring most traffic, but may bring irrelevant searches. Phrase Match – “Black Shoes”. Your ad will be shown to the query which contain these terms in specific order like “canvas affordable black shoes” – Your ad will be shown for this query but not for this – “canvas black affordable shoes”. Exact Match – [Black Shoes]. Most specific match. Ad will be shown when exact query has been entered. It will bring most relevant traffic. Negative Match – It eliminates searched phrases you don’t want your ad to appear on, such as cheap. This option prevents your ad from showing to people searching for cheap black shoes. 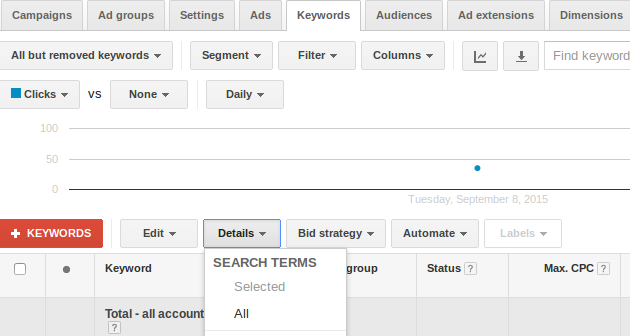 You can view the search terms which shown your ads in keyword tab of your account. Try using Keyword Planner, a free AdWords tool which shows you traffic estimates, like estimated clicks, to help you get an idea of how a keyword list might perform for a given bid and budget. Note that Keyword Planner gives you estimates for the Search Network only. The most hardest part – how to write ads that will get clicks. There is a way to see which ads get you the best results is to write three or four at one time. Then check your clicks. Ads with the highest click-through-rate are winners. 2. 2 description lines of 35 characters to describe what you have to offer. 3. Display URL – The display URL is what you display to the user in the advertisement. But when users click on ad they will be redirected to a landing page, it is the destination URL. Add target keyword in your headline. It makes your ad more relevant. Include the most relevant information first. Make it clear and concise. Google consider two key factors to determine the ad rank – Maximum bid and Quality Score. CPC bid is the maximum bid you specify for your keyword. Quality Score is a metric which determine how relevant and useful your ad is to the user. The quality score components are – CTR, relevance and landing page. The higher your quality score, the Better! Have you seen? Advertiser 1 pay less for a higher position because of high quality score. High Quality Score keywords will save you money and earn you better ad rankings. What is factors to determine Quality Score? As you see above, Ad quality impacts price. Here is some factors which determine Quality score. To get more insight about Google Auction, Watch This Video. Impression – How many times your ad is shown to the target audience. Click – If a searcher clicks on your ad you get a click. CTR(Click Through Rate) – The number of clicks ad receive over the number of impressions. High CTR leads to higher quality score and reduces CPC. CPM – Stands for Cost Per Impression. Advertiser will be charged for every 1000 times the ad is displayed. CPC – Cost Per Click, is the amount an advertiser pays each time someone clicks on their AdWords ad. CPA – Cost Per Acquisition, advertiser will be charged when the person who clicked on ad converts into sales. Conversion – It is a user action which takes place on website such as sign up, purchase, page view, complete the lead form etc. Bounce Rate – When visitor comes to a web page on your site and leaves without going to any other page this is considered a bounce. Google display network – Ads will appear on websites in the Google Display Network, which include all of Google’s partnering websites. Google search network – Ads will display when users do a search on Google this is known as Google search network. These include Google Maps, Images, Shopping and AOL. Re-marketing – This option shows your ads on the display network to people who have already visited your website in the past. Google adwords tool allows you to target precisely and exactly your most likely buyers. Let’s take an example you’re a shoe lover like me. And let’s consider you’re interested to buy some black shoes. You type the word “Shoes” into Google search engine. You’ll see ads (relevant to your query) appear to the top or to the right of search results. It helps to bring targeted traffic to your site within 10 minutes. So, if you are not using Google AdWords and PPC advertising to market your business you are missing a huge opportunity. I’m a huge believer in Adwords for business, having generated over 12,000 sales on my own websites from Adwords. I shared a link to your article on LinkedIn to help educate my connections. At my consultancy – http://www.inboundrevenue.com we use Adwords as a our primary online lead generation tool. It requires a lot of education to get people to understand the incredible value Adwords offers and I think you nailed it. Glad to know you found this article useful. Adwords is a very effective tool to generate sales and leads and get instant traffic. Thanks for sharing my article on linkedin. Keep in touch. The importance of Google adwords tool for a business cannot be under estimated. It sure has good relevancy for online success. Every business needs to take advantage of what this tool offers so as to increase traction and sales online. The good thing is that articles like this helps to increase online business success! It contains relevant details that will help the business owner exploit google campaigns for real. Yes Sunday, you are absolutely right Google adwords tool is a great tool for a business to generate revenues. As i mentioned in my post, If you’re not using adwords then you missing a huge opportunity. Thanks for sharing your views. Have a happy day!